The Halloween classic Night of the Demons is celebrating its 30th anniversary this year, but the party is truly just beginning with the definitive documentary on entire four-film franchise currently in production, and our invitation has just arrived, as the official trailer The Party’s Just Begun: The Legacy of Night of the Demons has just been released online. The best part is that Amelia Kinkade reprises her iconic role of Angela from the original Night of the Demons trilogy to host the new documentary in character! The official synopsis: From the company that brought you Leviathan: The Story of Hellraiser and Hellbound: Hellraiser II, You’re so Cool, Brewster! The Story of Fright Night, and the upcoming Pennywise: The Story of It, What an Institution! The Story of Police Academy, and RoboDoc: The Creation of RoboCop comes this brand new documentary on the Night of the Demons cult franchise. Fully supported by original Director Kevin Tenney and hosted exclusively by Amelia Kinkade, returning once again as the evil Angela, this documentary will unearth the behind the scenes shenanigans of the making of the original trilogy and 2009’s remake. With behind the scenes footage, interviews with the cast and crew, and a wealth of never-before-seen interviews The Party’s Just Begun is the ultimate celebration of Night of the Demons. A crowd funding campaign is underway on Indiegogo here. You can watch the official teaser trailer below, and be sure to read our interview with writer Chris MacGibbon on The Party’s Just Begun here. 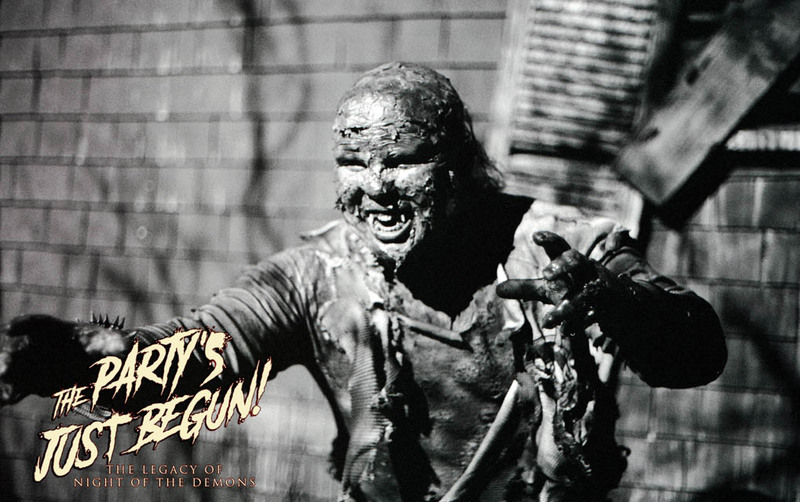 You can also see some exclusive photos and the official poster for the documentary below, and keep watching this site for more exclusive news and updates on The Party’s Just Begun: The Legacy of Night of the Demons as we follow the film’s development through its release in October 2019. Director Kevin Tenney on the set of ‘Night of the Demons’, courtesy of the documentary ‘The Party’s Just Begun: The Legacy of Night of the Demons’. Amelia Kinkade on the set of ‘Night of the Demons’, courtesy of the documentary ‘The Party’s Just Begun: The Legacy of Night of the Demons’. On the set of ‘Night of the Demons’, courtesy of the documentary ‘The Party’s Just Begun: The Legacy of Night of the Demons’.